We are approaching the end of the year and the holidays are upon us. This means, for many of us, eating delicious foods, staying indoors, and planning our New Year’s resolutions to lose all the weight that has accumulated. I wanted to take some time to bust certain myths and misconceptions people have about weight loss to set expectations in the right light, so here we go! Carbs make me fat, so I will cut them out and I will lose weight! While on the surface, cutting out carbohydrates will result in weight loss initially, it is an inherently flawed plan with a short-sighted mindset. Carbs did not make you gain all this weight on their own, it was an over-consumption of them coupled with a lack of physical activity, stress, lack of sleep, and potentially other reasons. Cutting out all of the carbs from your diet is akin to a smoker quitting cigarettes cold turkey. Sure, you may see some progress initially, but unless you have willpower of steel, you can easily revert to old practices when stress hits. Instead of cutting out all the carbs, do better with HOW MUCH you are eating and choose more quality carbs versus refined. I will just diet until the weight is off! Similar to the top, looking at losing weight as the primary goal tends to end in disaster. Just restricting calories to almost nothing for a few months will not lead to long term weight loss and keeping it off. It comes down to lifestyle changes. Those who embrace a healthier life with physical activity, choosing healthier foods, monitoring portions, and getting enough sleep daily will make massive headway towards losing that weight and keeping it off. Going on a diet is doomed to fail; Instead, look to change your lifestyle. I will just do hours of cardio! 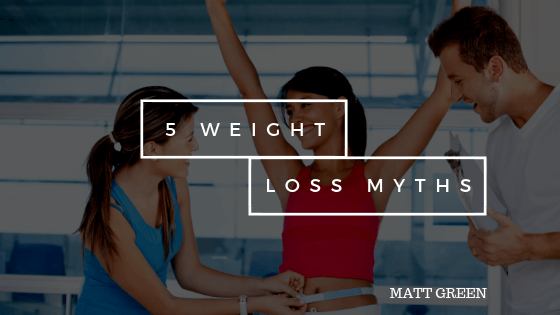 This myth tends to defeat many people just weeks into the journey of weight loss. Our body is a complex organism with many systems at play. So, weight loss is not simply input/output. You will have weight fluctuations based on water retention, salt intake, carbohydrate intake, hormone changes (especially in females), and so many more factors that are sometimes out of our control. Weight loss is like a jagged downward cliff. There are still peaks and valleys, but if you step back and look at the entire side, you will see a steady decline. Do not let a few bad weigh in days throw you off course! Weight loss supplements are the key! Many of these supplements are over marketed in their success and “shown” to promote dramatic weight loss. If you read the fine print though, many of them cite that the individuals who took them also adhered to an exercise and caloric deficit nutrition program as well. So, it makes it incredibly difficult to know if these supplements themselves had any significant impact. My advice is to save your money, commit it to the more impactful parts such as quality food consumption and a gym membership. While there are other myths out there, I believe these are some of the most significant ones out there in the world today. Understand weight loss is not an easy process and you will be uncomfortable. You will have to put in the work as there are no short cuts. So long as you can adhere to the basics and follow the foundation principles of weight loss, you will see your goals come to fruition.